Mario Kart Arcade GP 2 © 2007 Namco Bandai. This sequel to Mario Kart Arcade GP adds new characters Waluigi (from Nintendo) and Tamagotchi (from Bandai), new items, new courses, improved 'NamCam' functionality, and announcer commentary. 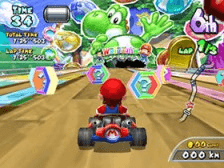 Mario Kart Arcade GP 2 was released on March 14, 2007. This game features the first 'crossover' between the Namco and Bandai portions of the new combined company, known as Namco Bandai. The Waluigi Cup Music theme was certainly inspired by The Prodigy song; Everybody in the Place (1992). The Japanese version of the game features color commentary by the prominent Japanese voice actor and on-screen personality, Koichi Yamadera.